Irish vocalist Susan McKeown has been called “the most strikingly original woman singer” in Celtic music by The Christian Science Monitor. Her extraordinary voice is a rare instrument: earthy, arresting, with an electrifying delivery. 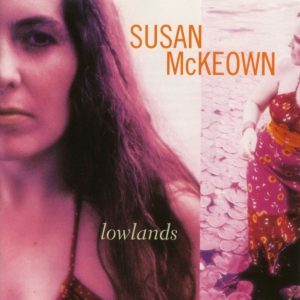 Whether singing her own songs with her acoustic-rock band The Chanting House or delving into the rich Irish and Scottish music traditions, McKeown sings with an honesty and passion unmistakably her own. In recent years, McKeown’s voice and music have captured the attention of audiences and musicians alike. She was the guest of Natalie Merchant on the nationally broadcast PBS-TV program Sessions at West 54th, and also sings backing vocals on Merchant’s Live album (1999). Fairport Convention’s album The Wood and the Wire contains a version of the traditional song Western Wind which they learned from “the wonderful Susan McKeown.” Susan appears on Cathal McConnell’s latest release Long Expectant Comes at Last performing backing vocals alongside Richard Thompson and Linda Thompson. Susan has also recorded extensively with Scot fiddle master Johnny Cunningham, with whom she tours regularly. Susan McKeown grew up in Dublin, Ireland, the youngest of five children. Her composer mother encouraged her early interest in music and theatre. She listened to religious and classical music as a child, but in her teenage years discovered Mary Margaret O’Hara, Michelle Shocked, and June Tabor. At age 15, she was selected for intensive study with Ireland’s leading opera trainer at Dublin’s Municipal College of Music, but left after a year to pursue rock, folk, jazz, and blues, often busking in the streets of Dublin. Susan had already toured in Europe and performed on national TV in Ireland when she left Dublin in 1990 to take up a scholarship offered her by New York’s American Musical and Dramatic Academy. She quickly immersed herself in the East Village and downtown music scenes, and was one of the original performers at the legendary Sin-é Café. Soon she was headlining in clubs such as The Bottom Line, The Mercury Lounge and Fez. She now tours internationally with her group The Chanting House, or with Johnny Cunningham and Irish guitarist Aidan Brennan. Susan first came to the attention of American audiences when her song If I Were You was selected for the landmark 1993 album Straight Outta Ireland, a track which she performed with fiddler Eileen Ivers, and Solas’ Seamus Egan and guitarist John Doyle. From there, she began putting together plans for an album of her own original songs: Bones was released on Susan’s own label Sheila-na-Gig, in 1995, and on PRIME CD in 1996. A track from Bones was licensed for the Channel 4 documentary series The Irish Empire which recently aired in Ireland, the UK and Australia. A second track was licensed for the Putumayo album Women of the World: Celtic II. Susan’s first album of traditional music was 1998’s Bushes and Briars on Alula Records, which received wide critical acclaim. Her new album is Lowlands (GLCD1205), released in 2000 on Green Linnet, her first international release. Susan’s other albums include the collaboration CD Mother with Irish-American singer Cathie Ryan and pianist Robin Spielberg; and the seasonal record Through the Bitter Frost and Snow with bassist Lindsay Horner. (The duo performed their rendition of Auld Lang Syne on NPR’s All Things Considered on New Year’s Eve). Susan’s songs have also been heard on national television commercials for Audi, Jaguar and Oil of Olay.